2012, Maggiorella L. et al. Nano Publications > Publications > In Vitro in Vivo NBTXR3 > 2012 – Efficacy of NBTXR3 in vitro and in vivo – Maggiorella et al. 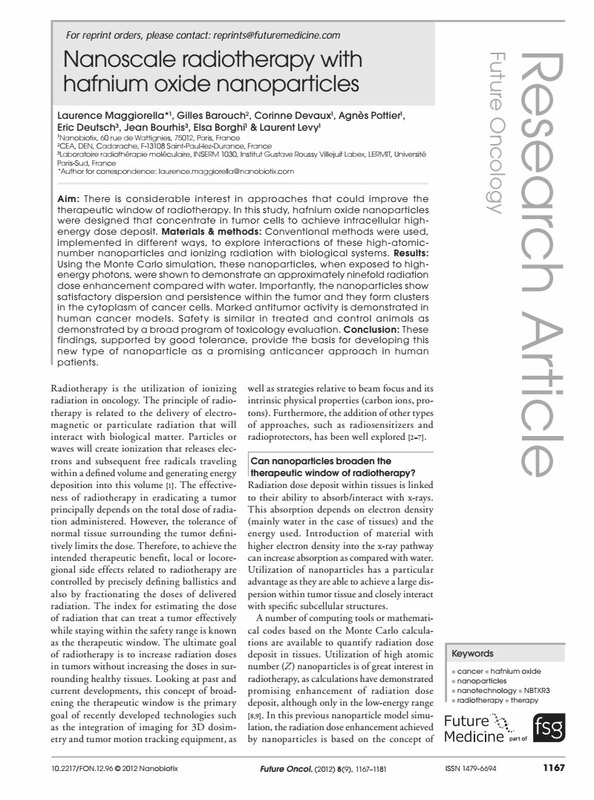 Aim: There is considerable interest in approaches that could improve the therapeutic window of radiotherapy. In this study, hafnium oxide nanoparticles were designed that concentrate in tumor cells to achieve intracellular highenergy dose deposit. Materials & methods: Conventional methods were used, implemented in different ways, to explore interactions of these high-atomicnumber nanoparticles and ionizing radiation with biological systems. Results: Using the Monte Carlo simulation, these nanoparticles, when exposed to highenergy photons, were shown to demonstrate an approximately ninefold radiation dose enhancement compared with water. Importantly, the nanoparticles show satisfactory dispersion and persistence within the tumor and they form clusters in the cytoplasm of cancer cells. Marked antitumor activity is demonstrated in human cancer models. Safety is similar in treated and control animals as demonstrated by a broad program of toxicology evaluation. Conclusion: These findings, supported by good tolerance, provide the basis for developing this new type of nanoparticle as a promising anticancer approach in human patients.